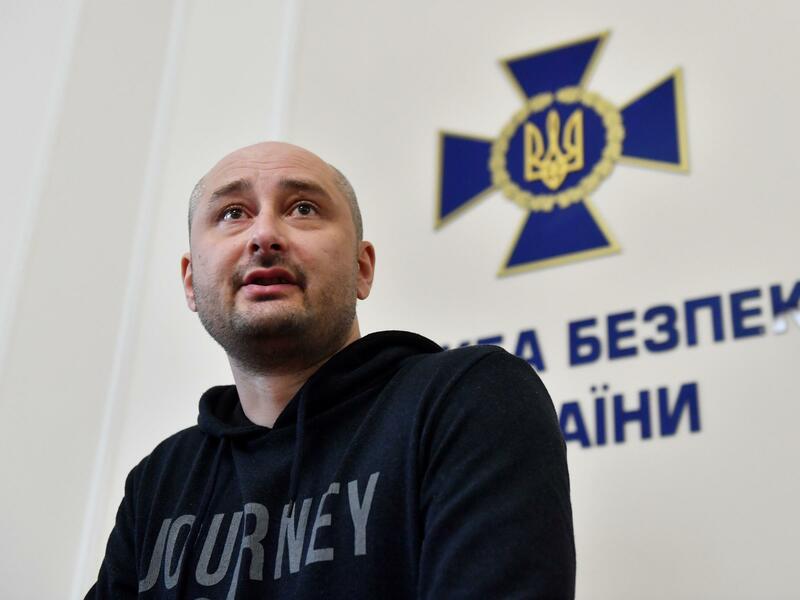 Russian journalist Arkady Babchenko, who Kiev police said Tuesday had been killed, showed up alive at a press conference Wednesday. His death was faked as part of a sting operation by the Ukrainian Security Service. "I'd like to apologize for everything you've had to go through," he said, according to a transcript from Radio Free Europe/Radio Liberty. "I've been at the funeral of many friends and colleagues, and I know this nauseous feeling. Sorry for imposing this upon you, but there was no other way." "Special apologies to my wife for the hell she's been through these two days," he added. "Olya, excuse me, please, but there was no other option." It's not clear exactly what his wife knew. On Tuesday, Kiev police told reporters that Babchenko had been shot multiple times in the back at his apartment and had died from his injuries. His wife was said to have found him bleeding from his wounds. Police said Babchenko had been targeted because of his work. "Before ushering Babchenko into the room, Gritsak said investigators had identified a Ukrainian citizen who had been recruited and paid $40,000 by the Russian security service to organize and carry out the killing. The unidentified Ukrainian man in turn hired an acquaintance who had fought in the separatist war in eastern Ukraine as the gunman." Babchenko had moved to Kiev in the fall after fleeing Russia, where he was a prominent war correspondent who in recent years had become fiercely critical of the Kremlin. In Kiev, he has been a television host on Crimean Tatar network ATR. Video shared on Twitter by Radio Free Europe's Russian service shows his ATR colleagues rejoicing in cheers and disbelief at seeing Babchenko alive. A photo of Babchenko hangs on the wall behind them. Ukrainian President Petro Poroshenko tweeted his congratulations to the Ukrainian Security Service and said he had given an order to provide Babchenko and his family with protection. A spokeswoman for the Russian Foreign Ministry wrote that it was good news that Babchenko was alive, but said Ukraine had used him as a "propaganda effect." Writing last year in The Guardian, Babchenko described how a Facebook post he had written about the Russian bombing of civilians in Aleppo, Syria, was deemed insufficiently patriotic and led to a systematic campaign against him. The Committee to Protect Journalists tweeted a statement skeptical of the sting operation. "We are relieved that #ArkadyBabchenko is alive," it said. "Ukrainian authorities must disclose what necessitated the extreme measure of staging news of the Russian journalist's murder. CPJ is investigating this unprecedented situation and will have further comment once we have more details." In 2016, investigative journalist Pavel Sheremet was killed when a bomb exploded his car. The case is unsolved.